and it's here to provide good sourcing and solutions for manufacturing companies seeking specific supplies and/or services. All of the companies placed and appearing in this Manufacturing Links Directory are very competent international companies, who will assist your production and help solve your problems. They will have your interests and success at heart. To exceptional production and services company visitors. If you feel your company has services or supplies that would be useful to other companies and you would like to be included here, please let me have a brief account of your area of expertise, a contact name, a website address and perhaps your company logo. I will review your website and give your company a presentation here, outlining your usefulness to visitors to this website. The intention of this page is to form a manufacturing links directory of industrial of services and solutions for visitors to this site. All I ask is you mention this website, (although a reciprocal link would be nice). What are you waiting for? Barwit Control Systems was established in 1973 to address the then fledgling market for power control systems utilising variable speed drives. Its core business quickly became the design and manufacture of bespoke panels incorporating PLCs, Scada and Fieldbus systems. Barwit has maintained its position at the leading edge of this technology by designing and producing remote monitoring and control power systems. Nevertheless, Barwit continues to build panels to customer designs and specifications. 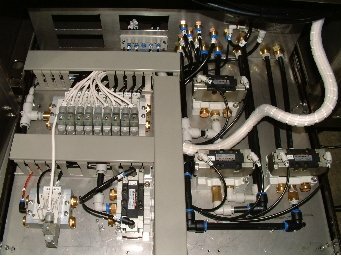 Barwit Control Systems provides a complete service of electrical and mechanical system design and build. With a team of engineers with expertise in most areas of industrial control. - Motor Control - AC Inverter and DC Drives. - Remote Monitoring and Signalling Systems. Certified to ISO 9001:2000 Barwit Control Systems offer a full range of services. Also they an approved Mitsubishi distributer & a Member of ERA. Established in 1982 by Gordon Griffiths, Griffiths Precision Engineering is a precision machining subcontractor with a long track record in the manufacture of special tooling. Most of GPE’s work is within the one-off to 20-off category, although the company can handle production volumes as required. Ongoing investment in CNC technology and CADCAM has equipped GPE to machine complex components in virtually all materials, including stainless steels, titanium and aerospace alloys. Typical of the type of work undertaken is the special tooling used in car seat belt test rigs and in the testing of diesel engines. However, the well-equipped workshop allows the company to apply its knowledge and skills to a broad range of machining work. Success in the highly competitive world of subcontract machining depends on building strong relationships. It also depends on having the flexibility to deal with the unexpected, and having the skills and equipment needed to satisfy the requirements and expectations of each and every customer. LEM LTD - A market leader in providing innovative quality solutions. LEM is a mid size company with a global feel. We have 950 employees worldwide and reported a revenue of CHF 196.8 MCHF in 2008/09. TECH LTD - Electronic Engineers to Industry. Tech Ltd was formerly known as Conprol Services Ltd. and established in 1974. We are a traditional family run business, and the managing director, John Bridges, is an engineer and sole proprietor. Our customers include a number of large print and packaging companies who call us when they have a breakdown. These customers feel secure in knowing their problem will be solved quickly and backed by excellent workmanship. Most of these companies have been with us for over 15 years and rely on our service. We also undertake work for a number of food packaging companies where, as well as downtime, cleanliness is of critical importance. Our well known attention to safety issues has brought us repair work from divers, lift engineers and bomb disposal companies. Tech Ltd has grown over the years based on recommendation. We do not advertise, and all our business is based on word of mouth. The story of Mitsubishi began in 1870, when Yataro Iwasaki founded a shipping company in Osaka with three leased steamships. In the years that followed Mitsubishi expanded to become a multinational company through acquisitions and the establishment of new enterprises in other sectors, including mining, shipbuilding, banking, commerce and property. In 1921, Mitsubishi Electric Corporation was formed by spinning off the division for the production of electrical equipment for ships. Today Mitsubishi Electric has factories, R&D centres and sales organizations in over 120 countries worldwide. The three diamonds logo is famous as the trademark of Mitsubishi Electric and over forty other international companies active in finance, commerce and industry. The logo has a direct relationship to the company name. Mitsubishi actually means "three diamonds" – it is a combination of the words mitsu (three) and bishi (stone or diamond). Just like the name Mitsubishi, products and services bearing the three diamonds logo stand for state-of-the-art technology and first-class quality all over the world. From a lock-up garage in North-West London, J H Waring and P M Sebestyen established a company called Radiospares Limited, which began operating from a small building in nearby Birchington Road, supplying radio repair shops with spare parts for radios. It was from there that RS began its journey to becoming the market leader it is today. From the very first day of trading, in 1937, RS had the simple objective to provide a replacement part for every job. For more than 60 years RS has been dedicated to a single purpose: service excellence. In that time, RS has become Europe's leading distributor of electronic, electrical and mechanical components, health and safety products, and associated tools. As times have changed so has RS. As new technologies have emerged, RS has embraced them. Today, I.T. and communications products are pre-eminent and RS keeps ahead with new product introductions and innovations that enter the market. Supporting engineers all over the world RS now has operating companies based in over 25 countries, including France, Italy, Germany and Denmark, with operations as far afield as Chile, America and China, and distributes to over 160 countries worldwide. Established in 1939, by Alan Farnell and Arthur Woffenden A.C.Farnell Limited originally sold radio parts but later broadened their product range to focus on the wholesale market. In 1966 Farnell Electronics floated on the London Stock Exchange with a turnover of just c.£2million reaching c.£200 million by 1990. Today, Farnell is one of the worlds leading distributors of electronic, electrical, industrial and maintenance, repair & operations (MRO) products. Farnell is a world leading high service, low volume distributor of electronic, electrical, industrial and maintenance, repair & operations (MRO) products – with fast, easy access to over 430,000 stocked products, 24 hours a day, 365 days a year. OYSTAR Aerofill Dawson – Over 150 years of Filling and Closing Innovations. OYSTAR – The Process & Packaging Group is one of the world’s leading providers of process know-how, packaging equipment and technology, and corresponding services. OYSTAR AEROFILL DAWSON combined have been supplying innovative filling and closing solutions to the Aerosol, Dairy and Juice markets for over 150 years. All systems are designed to meet the exacting requirements of our customers, from low speed semi-automatic to high-speed fully automated solutions. At our new Production Facility, Customer Service Centre and regional Sales Offices we employ approximately 110 people. HARLAND HMS - Leaders in pressure sensitive labeling machines. Harland Machine Systems, established in 1972, are a world leader in the design and manufacture of a comprehensive range of high quality, reliable, efficient and cost-effective pressure-sensitive (PS) label handling and application systems. Designed to meet the specific requirements of diverse markets, Harland Machine Systems have become the recognized benchmark for excellence in PS-labeling technology. We have received many industry innovation and service awards in recognition of this total commitment. Whether the PS-labeling equipment be for a small, local supplier or part of a global contract with a ‘blue-chip’ multinational, the need to design and build to stringent specifications and performance standards is our prime objective. ILAPAK is one of the most experienced and fastest growing manufacturers of industrial wrapping machinery for primary packaging utilising flexible wrapping materials. We provide the full range of products and dedicated services that our customers need to achieve success in their markets. Founded in 1970 on the principles that customer focus and a dedication to service were key to customer satisfaction, we now generate an annual turnover of more than €70 million, with over 400 skilled professionals delivering more than 600 individual machines and complete automatic packaging lines to our customers each year. Solid Partner with Flexible Solutions. In ETA, innovation has developed on different fronts over the years: product innovation, process innovation, approach innovation. This was possible only through consistent evolution and by constantly upgrading our competence. Since our creation in 1979 we have grown to become a dominant force in the enclosures market offering high quality innovative products. We have sales and distribution channels in most countries with competent people waiting to talk to you. We constantly strive to be the best. Be part of it! From its humble beginnings in Nassjo (Sweden) in 1922, Eldon has certainly developed into a significant provider of enclosures, however our ideology hasn’t changed. Today’s management team believes in the same fundamental principles as our founders, Karin and Josef Randholm: design, quality and customer satisfaction. We are committed to a continuous improvement plan, and invest in new technology wherever it is appropriate. Although automation is an important part of our strategic plans, any potential project undergoes a strict evaluation before starting, because we believe in controlled growth, and the need to allow time for our internal processes to keep up with our expansion. We also never compromise quality for the sake of efficiency or profit, because our reputation remains our most important asset. All our production facilities are ISO-9000:2000 certified and are regulated independently audited. Although Karin and Joseph couldn’t have possibly imagined Eldon's great development to the 21st century, we remain a privately owned company with ambitious plans for the future. Established in 1975, J & A Precision Engineering is a long-standing, experienced company dedicated to quality and consistency. Here at J & A we are very proud of our reputation as a reliable and trustworthy company and we always put our customers’ needs first. We deeply value each and every on of our clients and we show our appreciation through our personal service, professional attitude and reasonable pricing scheme. Precision EngineeringWe can probably arrange delivery to most areas of the UK. Many varied industries appreciate our expertise so please feel free to contact us to discuss your precision engineering requirements or for a competitive quotation! Precision Engineering (Medway) Ltd is a complete in-house special purpose machine building and general engineering company specialising in the design and manufacture of Assembly Systems, Automation Systems, Test Equipment, Honing / Bore Finishing Equipment, subcontract component manufacture, fabrication and machine building. Established in 1961 Precision Engineering or PE as we are more commonly known employ a highly skilled and reliable work force who are managed by an experienced and professional management team. Our manufacturing facility is 20,000 square feet on a 1.1 acre site with agreed planning permission for future expansion. The company owned facility offers a modern and efficient design and manufacturing enviornment providing our customers with the knowledge that their projects are completed on time, within budget and importantly produced completely in-house. The company has invested in the very latest 3D-design packages, CAD/CAM technology and ERP systems. Our equipment is primarily used in the highly demanding Automotive, Hydraulic, Pharmaceutical and Medical industries. As this manufacturing links directory grows, it will sorted into relevant category's to make finding a solution for your problem easier. We are hoping for enough participation to make this the foremost manufacturing links directory for solutions to industry on the web. <!- Bottom page links --> Return from Manufacturing Links Directory to Home page.